A great playing turf surface, college dormitories, healthy meals in the dining hall and access to the best coaches will aid your ability to reach new heights as a player. This camp is for ages 10-18 and will cover all the technical and tactical training to help you improve. Every camper will receive a limited edition reversible jersey, ball, water bottle, and lanyard as well as other fun prizes. Revolution Field Hockey Camps are USA Field Hockey Partner Camps – making recommendations into the Futures program. Check In: 12pm – 1pm for both commuters and overnight campers. Tip for Extended Day Campers is to come at 12:30pm. First meal is Dinner. Check-in location will be at Bennett Dorm. Check Out: Wednesday, July 25th. Parents are invited to attend final scrimmages that begin with warm-ups at 9:00am. Check-out and departure will follow at 12:00pm at Bennett Dorm. The nearest airport is Richmond International Airport, in Richmond, VA. You are responsible for getting yourself to and from campus, Revolution Field Hockey does not provide transportation. 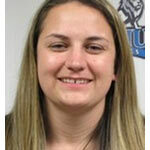 Ashley Kishorn took over as the new Head Field Hockey Coach at EMU in June of 2017. She was an assistant coach this past year at Williams College (Mass.) after three years on the sidelines at ODAC-rival Lynchburg College recently, earning a master’s degree in educational leadership. Kisner also coached at Wilson College (Pa.) following a playing career at Salisbury University, where she was a starter on a team that won the 2009 National Championship. Kishorn replaces E.A. Jackson, who resigned after two seasons with the Royals to take the head coaching post at D-I Towson University. Jackson left the program in good shape, with roster numbers higher than they had been in two decades. The 2016 team finished 7-10 for the most wins since 2011. With first-hand experience of coaching in the Old Dominion Athletic Conference, Kishorn said the continued rise in competitive play in the conference entices her. Kishorn inherits a team that had four All-ODAC honorees last fall, including two returners: two-time First Team defender Emily Augsburger (Lancaster, Pa./Lancaster Mennonite) and Third Team attacker Emily Price (Hampton, Va./Homeschool). King said Kishorn is a good fit to continue the program’s recent momentum. For Kishorn, becoming a head coach is part of personal journey that started a decade ago.